A senior alarm can protect your aging parents in a number of ways. Personal safety as well as safety of a loved one can be serious concerns for seniors. There are different types of alarms that could be considered. There are elderly alarms for home safety or those for personal safety. There are also alarm ideas to consider the safety of a loved one that is be experiencing different stages of dementia. Of course, as technology advances, so do alarms. Some of the products coming out today are really amazing. Why Is a Senior Alarm Needed? Falls and other safety risks are more common in the elderly population. Consequences are often worse as well. An elderly person is at a much higher risk of injury due to a fall or other safety concern than a younger person. The rate of hip fracture resulting from a fall, for example, is significantly higher in people over the age of 70. Seniors are more likely to experience complications if they do not get help quickly. Alarms for the elderly can make a huge difference in the ability of the elderly to access emergency services. A senior alarm for personal safety is available for both inside and outside of the home. Home security and increased safety measures for people experiencing difficulties with memory are also important to consider. Seniors might consider a home alarm system to increase safety and decrease worry of break-ins, especially at night. 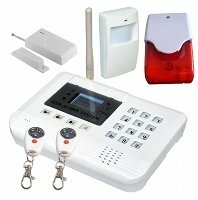 There are many different types of elderly alarm systems. Some of the alarm systems offer the option of alarming the home while a person is inside. Often, alarm systems will allow you to arm them from your bedroom when you go to bed at night for extra protection. An elderly medical alert is usually worn as necklace pendants, attached to the belt or on the wrist. They have a button that can be pressed in case of emergency that will immediately connect them to an operator. Some of the medical alerts have a loved one as the primary contact. If this person is not available, the service will then contact emergency services. Other medical alerts will open a two-way communication system and check in with the senior directly about the problem. A plus of this type of system is that the two-way communicator can be comforting to an elderly person in crisis as they will often stay connected while the senior waits for help or emergency services to arrive. Each personal alarm company should contact emergency services if the senior is unresponsive. This is an elderly alarm that involves installing HELP buttons in a senior's home. The main concern with these alarms for the elderly is they are often secured in a certain spot and may be difficult or impossible for a person to access if they experience an injury that makes them unable to move, such as a serious fall. Cell phones for elderly can be great for increasing safety and putting family's minds at ease. When outside of the home, seniors might consider carrying a cell phone for emergencies or to call for help if they have a fall. Recently, there have been elderly medical alerts with a GPS (global positioning system) and/or 2-way communication system developed for outside the home. These have a tracking device in them that can help individuals be quickly located in case of emergency. The tracking device may also be helpful to locate seniors with dementia who might be at risk for wandering or getting lost. With the rapid advances in technology, there are cell phones coming out now that have a GPS installed and also have an emergency button. Senior alarm systems for the home can be very effective for preventing wandering for elderly with dementia. The senior alarm can be programmed to allow people to move around inside the home freely but go off when a door to outside the home is opened. If the person with dementia tries to leave the home while the alarm is on, the alarm will sound and other people at home will be alerted. This allows other people at home a bit more freedom as they will not feel they have to keep an eye on their loved one at all times. Elderly medical alerts with GPS may be helpful for those people with dementia that are prone to wandering. If their loved ones are not comfortable with or cannot afford an indoor/outdoor alarm system, this may be an option that can help them quickly locate their loved one if they go missing. Depending on the size of your city, your local police station may have a Wandering Alert. This is a registration system for people with dementia that may or may not include a medical alert bracelet and will make your loved one known to the police as a possible wandering risk. A Bed alarm is a senior alarm that can be installed under a person's bed sheet that will alert caregivers when a person has sat up in bed or gotten up at night. Baby monitors can be used to better monitor a person's movements during the day or at night if there are concerns.